The Yahoo Query Language is an expressive SQL-like language that lets you query, filter, and join data across Web services. With YQL, apps run faster with fewer lines of code and a smaller network footprint. Yql provide syntax’s like sql so that we can fetch data from yahoo web services. We already know about web service like SOAP and REST but YQL is very simple to use in web sites. This is very special language to yahoo to fetch yahoo data . But we can also provide our data available to YQL using data tables. You can click on Test button and see the result. Here YQL provide to kinds of data JSON and XML before click on test button you can select any of formats then data will be showed in result part. Once the result is desirable then copy the URL which showed in bottom this URL can be used to get content. 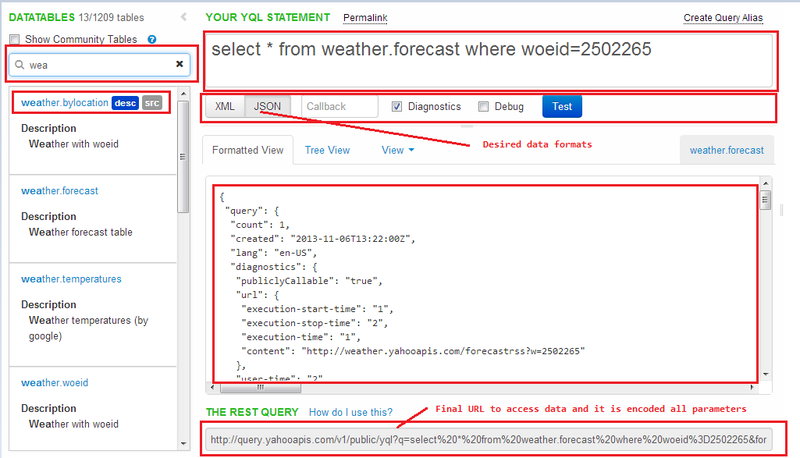 In the result you can see the data related to weather you can identify json or xml structure and retrieve in website. If see URL you can identify url and its query string but here all parameters are encoded format. For know what parameters using you yql statement you can decode URL. The following is URL decoding in online. Query: select * from geo.placefinder where text="22.2500,114.1667" and gflags="R"
If some time we did not find any web services simple from web page you can fetch data and you can filter the content. We can open page and identify the required content from page using Chrome inspect element option. Find the xpath of content and apply to YQL. YQL is like sql statements to fetch content from yahoo web services. These all information they provided as data tables. So that we can use YQL against data tables to fetch the content. YQL provide xml and JSON formats. Each YQL statement can be provided as web URL so that we can directly execute in browser and see the result. To fetch the content from data table yahoo provides one URL and we need to use that public URL and pass some query parameter to get result. By this we can send Ajax calls. Yahoo provide special module YQL module from their java script library i.e. YUI. We can use YUI yql library to get content from data tables. YQL very convenient way to use in web site because we can use this with java script libraries like jquery,YUI or other java script libraries. YQL also provide way to fetch html content for web page as json or xml format so that we can use this data in website this scenarios happen when we don’t have web services.